Underground inspection for street-, railroad- and pipeline constructions. Investigation of geologic boundaries, ground water level. 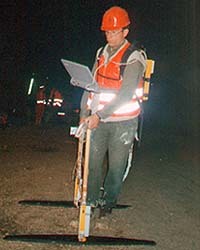 Detection of buried foundations, residuals, deposits, pipelines and cavities. Reconnaisance of a heap. The radar profile shows the extension and thickness of the materials deposited. Georadar investigation of a paved road affected by mass flow movements: Cavities, cracks and block structures rotated against the topography.